Are you guys in some Christmas mode by any chance? have two tags boy-friendly and the other two girl-friendly. Amber's blog partly because she has such a lovely, lovely family. hers and I am all of a sudden super nice lol. so I hope these two will make her happy too. 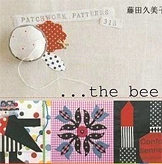 from a patchwork book from the library. Yup Christmas is still three months away. But we know it will come before we know it! I can wait untill you publish the utensil tray tutorial. Your blocks are amazing as always Ayumi!! 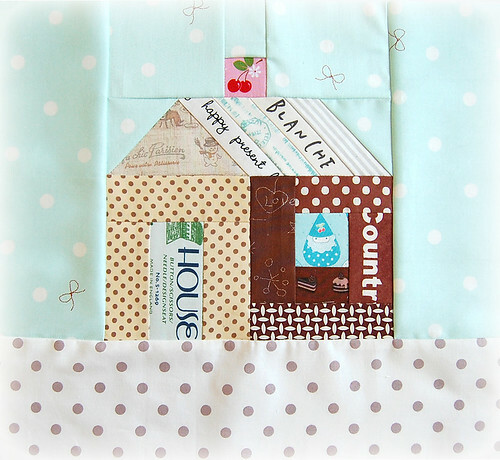 I'm really liking house blocks lately, time to sew one up myself I think. those are adorable! Love the embroidery on the tags. Such a nice touch! I can't wait for your tutorial! I'm raising my hand right now!!!! I'm definitely in Christmas mode! These are so adorable. I CANNOT wait for the Christmas season and all the fun crafts that go along with it. Those gift tags are fantastic! I love the little "shoo-fly-esque" hole in the top especially! Absolutely brilliant! I just especially love the gift tags block, such imagination. ayumi, can you be less amazing please?! you're so so talented and the tags and house are fantastically done. oh and that tutorial, yes please! 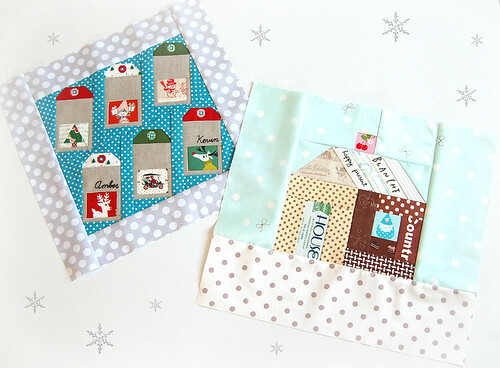 I love the gift tags block - do you have a tutorial for it?!? It would be perfect for the christmas sampler quilt I am making. Thanks! Please..........a tutorial and a pattern. Gosh I love them. as always, your innovation and talent have me mesmerized. I love both blocks and all those yummy fussy cuts are just beautiful! Ayumi, you make the most wonderful blocks and tutorials. I get so much inspiration when I read your blog! thank you so much for all you share. as usual Ayumi, you're sooo talented. Awesome!!! I don't even know where to start on those gift tags, Ayumi! 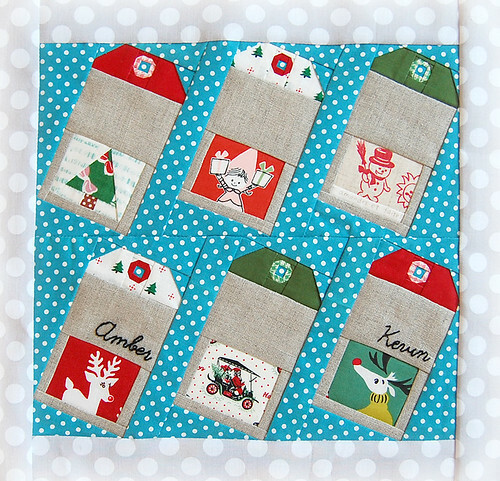 The tiny fussy cut white on blue dot in the centre of each tag hole, the tiny surrounding colour of each hole, the perfect fussy cut Christmas images, the exact angle of each tilted tag, the genius choice of blue background for a Christmas block. You are amazing. So snowy and Chirstmassy all at once- and I mean both blocks! These are so very new- lots of polkas, a repeating design unit and a whole lot of cuteness! I love your blog! Your work is amazing! Sweetness found in houses and blocks! Seriously? Can this get any better? (is what I think every time I read your blog). Love these blocks. The tags are just the cutest! I love the blocks and the adjustments you made to the house block are perfect! Looking forward to the utensil tray tutorial. Thanks for putting it together! YEA!! been waiting to see if you would do a tutorial. Thanks! Love your blog. Amazing and very thoughtful! I love how you personalized the tags with their hand-embroidered names. You are so talented! Just found your post from Flickr, and I LOVE these quilting blocks! Your blocks are beautiful! I am sure she will be thrilled to get them. these two blocks are perfect in every way. just the right touches of sweet, modern, nostalgia, bright, happy and warm. i love them soooooo much. You truly are so amazing and talented!! Really beautiful blocks, again! :-) I love the fabrics and colours! And I like that there's always a bit of humour in your work. 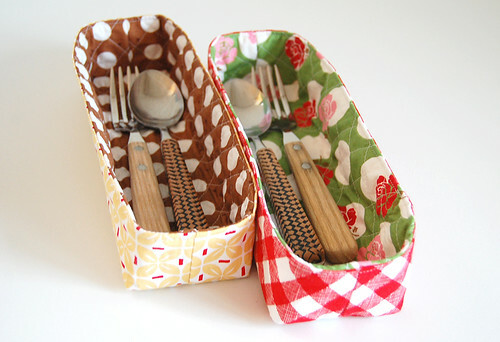 I'm looking forward to the tutorial, the trays really are a great gift idea! These are adorable! I can't wait for the tutorial! Seriously AB FAB!!!!! everything posted is wonderful! The polka dot snow in the sky and ground are a perfect touch! Oh my! You rounded the corners of the circles at the tops of the gift tags. Seriously awesome blocks. I'm just shaking my head in admiration and holding my breath for the tutorials. Yay! I love the solid linen with these. Well this is an amazing project and you always choose the perfect fabric. But the linen choice was great. So what do you use for the solid linen/look fabric? I love Christmas so much, and your blocks strike the right giving kind of mode! I can't wait for a new PP tutorial. I could fill them with sweet treats! Another wonderful post full of fabulous creations! You're such an inspiration! omg, you're killing me! Every post has a block cuter than the last, if that's even possible. Will you share your technique? I'd love to even just try. Can't believe you have pieced the hole in the label with the reinforcing circle round it! Such great detail! The house is supercute - would Santa mind if I moved in? I know you're a busy lady, and your tutorial are fabulous and your work amazing! I would LOVE, and BEG for a tutorial on designing paper piecing patterns. 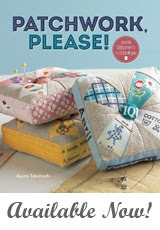 AND (yes there's more), have any of the publisher's gotten you to have a book of all your Swap patterns? I love them all. Olá Ayumi!Amo tdo que vc faz!! Gostaria que me indicasse onde posso comprar,fecho de metal,para chaveiro,aquele que se faz com cadarço de lona! !Não estou encontrando aqui no Brasil,se vc souber de algum site que venda vc me passa?Muito obrigada!! !Beijos Ou alguém que souber!! !Por favor!!! your blocks are adorable, absolutely amazing!! 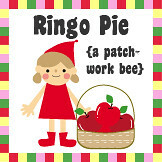 I`m very glad that I found your blog. easy to follow , sewing was very fun! I`ve linkes you on my blog. Your blocks are so fantastic!! very very nice basket, thank you very much for the instructions! !